GARDNERVILLE, Nev. — While a handful of Republican students from the University of Nevada, Reno discussed politics over sausages and fried lamb testicles here last weekend, a woman decked out in a patriotic red, white and blue outfit walked by. She pointed to one of the students wearing a Dean Heller campaign sticker. “It must be lonely,” she observed. For Heller, the Nevada Republican who is widely considered the most endangered senator up for re-election in next year's midterm cycle, it was a sentiment that sums up his narrow and treacherous political path to victory. Facing substantial opposition from both conservatives within his own party and a general electorate trending Democratic, Heller's list of political foes sometimes appears far larger than his number of supporters. Heller's re-election challenge is three-fold: He must attract enough support from an increasingly conservative Nevada GOP base, especially in the northern part of the state, to avoid being ousted in a primary. He must manage a difficult relationship with President Donald Trump in order to avoid alienating voters in either the GOP primary or next fall's general election. And he has to be mindful of the state's overall electorate, which voted for Democrat Hillary Clinton in last year's presidential race. Those challenges were evident at the third annual Basque Fry in August, a Republican fundraiser at a sprawling cattle ranch hosted by the political action committee of Adam Laxalt, the current Nevada attorney general and likely gubernatorial candidate. More than 2,000 Republicans mingled over Basque delicacies in between political speeches. Many of the attendees were from the northern part of the state, where Republicans are often more conservative than their counterparts in more populous cities like Las Vegas. While Trump’s approval ratings hover around 38 percent nationally, Republicans here still support the president and they expect their elected officials to do the same. That was top of mind for 75-year-old Claire Price of Incline Village, who said she is still angry that Heller didn't back Trump at last year’s event during the presidential campaign. “I thought that was a real political problem for him,” she said. Republicans at the fundraiser were mostly supportive of the president and blamed Congress — as well as Heller, specifically — for any lack of progress on his agenda. “I actually think it’s a pretty sad state of affairs that Congress will not support [the president] and make meaningful accomplishments, and our senators better be very careful in every state across the nation that if they don’t get behind their president and make things happen, they are going to lose their seats and I’m going to be a party to that,” said Leslie Burnside, 57, from Minden, Nev., who was wearing a camouflage Make America Great Again hat. Trump’s attacks on the GOP-led Congress appear to be working when it comes to these Republicans. But, as the Heller race illustrates, the consequence could be Republicans losing their narrow Senate majority if GOP primary voters succeed in defeating sitting incumbents or rejecting candidates with broader general election appeal. And Trump is already playing a central role in both races. In the primary, Heller is facing Danny Tarkanian, a perennial candidate with a famous last name who is touting his total support for the president. In the general, Heller would likely face Democratic Rep. Jacky Rosen, who is seeking to show that his voting record is right in line with the Trump agenda. “Dean is going to stand on his own record. Nevadans know him for that and Nevadans don’t like him for that,” Rosen said in an interview after a gathering of progressive leaders in East Las Vegas. So far, Heller has walked a fine line in his association with Trump even as the president's sometimes divisive style has clashed with Heller's jovial and mild-mannered public persona. Despite their differences, which have included a public spat over health care reform, Heller insisted that he wasn't that far apart from the president in an interview with NBC News in Las Vegas last week. 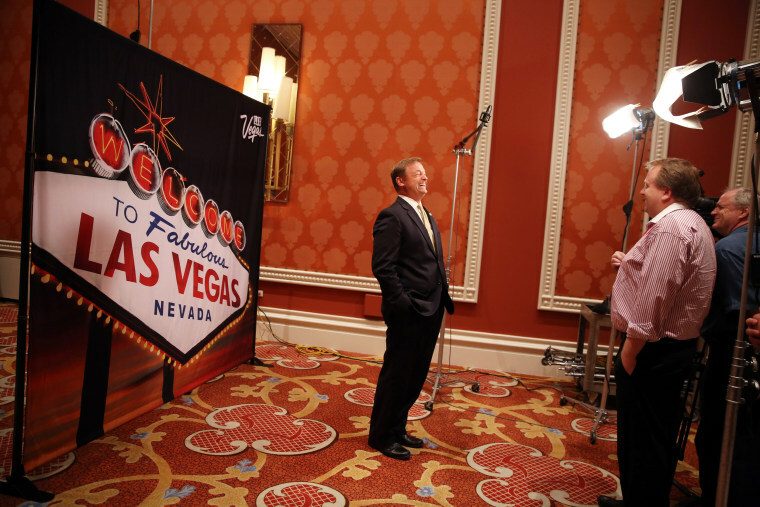 Since January, Heller has kept a low profile both in Washington and in his home state, doing just a smattering of media interviews and keeping his public schedule confined to small and non-publicized events. That approach was on display at the Gardnerville event. He showed up for just the last 20 minutes of the four-hour Basque Fry. He hovered mostly around the VIP tent where other elected officials and program participants sought shelter from the blistering sun and spoke to attendees who approached him instead of meandering through the crowd. Aside from his relationship with the president, Heller has also come under fire from Nevada conservatives for a lack of ideological clarity. He received heavy criticism last spring when he told a town hall audience in Reno that he has “no problem” funding Planned Parenthood, a hot-button issue for social conservatives. And while his spokesperson attempted to clarify the remarks, saying the senator remains opposed to federal funding of organizations that provide abortion services, many Republicans in the state are still holding it against him. “He is a spineless, lying jellyfish,” said Burnside of Heller. On health care, Heller held a news conference with popular Nevada Governor Brian Sandoval after the release of the Senate’s first version of the bill, saying that he wouldn’t support it because it would strip health care away from too many of the 600,000 Medicaid recipients in the state. After arm-twisting by Trump that included a brief run of televised attack ads against him by a pro-Trump super PAC, Heller split the difference. He voted against the Senate’s more robust repeal and replace bill, and against a straight repeal of Obamacare — the same bill he supported in 2015 when there was no chance it would become law. But he voted for the most scaled-down version known as the “skinny” repeal, which failed by one vote. The health care vote was at the beginning of August. John Manelly, a constituent from Mindon, is fed up with Heller, saying the senator went to Washington and became a weak conservative. “He’s been too wishy-washy all along. His credibility is shot,” Manelly said. Immigration is another key issue for these voters, many of whom said they support Trump’s pardon of Sheriff Joe Arpaio, the construction of a border wall and ending reprieve for the children of undocumented immigrants under President Obama's DACA program. In his interview with NBC News last week, Heller shunned some of Trump's anti-immigrant policies, including a pardon of Arpaio. He also touted his support of comprehensive immigration reform in 2013, a bill that was reviled by many on the right. “He is an open borders guy and instant legalization guy,” Dayton, the Marine veteran, said of the senator. But the immigration issue cuts the other way during a general election in a state where Latinos are a growing voter bloc. Latinos made up around 17 percent of the state’s electorate in the 2016 election. And Heller's attempt to appeal to the Latino community, and shun some of the harsher edges of Trump's policies, hasn’t won over Rudy Zamora, an immigrant who benefited from DACA and got his U.S. citizenship last October. Heller's new campaign chair, Nevada Lt. Gov. Mark Hutchison, who called Heller "one of the finest people you’ll ever meet on planet Earth," said the senator will maintain his independence to do what's best for the Silver State. "Dean will support President Trump when Trump pursues policies that benefit Nevada, and when he pursues policies that don’t benefit Nevada, then Dean’s gong to speak up and change the direction of that policy," Hutchison said. On paper, Heller would appear to be a heavy favorite in next June's Republican primary. Tarkanian, the son of legendary UNLV basketball coach Jerry Tarkanian, has run five previous times in the state and never won in a general election. Heller, meanwhile, has never lost a political race and has the state and national GOP establishment backing him with both organization and, most importantly, resources. But at the Gardnerville event, the conservative crowd gave Tarkanian a warm reception as he defended yet another run for political office by pointing to his last race where he lost by just 1 point — less than the margin Trump lost to Hillary Clinton in the state. And voters here were enthused by Tarkanian's conservative candidacy and lock-step support for Trump on the issues — supporting the pardon of Arpaio, defending Trump’s response to the protests in Charlottesville, Virginia, and getting behind his border wall. "I like what he's trying to accomplish policy-wise," Tarkanian said of the president. But Heller is preparing to return to work in Washington where he will face ten more months of difficult Senate votes on issues like raising the debt ceiling, funding the government, tax reform and possibly even health care again before the primary. And with no big legislative successes in the first half of 2017 for senators like Heller to point to, the pressure is building from the base to deliver results. “Personally, I like Dean Heller. But again he better get behind his president and get some stuff done,” 62 year-old Pam Bergamini of Garnerville said.